Lucy is one of two highly trained therapy dogs in the Prosecuting Attorney’s office. Lucy has several important roles. She provides support and comfort to victims of trauma and abuse. Lucy helps break the ice when children are asked to talk about sexual and/or physical abuse. She is in the courtroom, hidden from jurors, sitting with children as they testify in court. Some families also request that Lucy sit with them as they watch the trials of people accused of killing their loved ones. Lucy is also the newest member of Snohomish County’s juvenile drug treatment court. She and her handler, Kathy Murray, attend staffing and are also present in the courtroom. Lucy lies near the bench on her blanket. She provides support for the youth while in the courtroom. She also helps the team. It’s tough on the team members when a youth has not succeeded in breaking free from their addiction. Having Lucy there helps ease frustration and sadness and keeps the team focused on helping every youth in drug court have the best chance of success. Kathy, Lucy’s handler, is also developing a program that will allow drug court youth who like animals to earn community service credit by working with Lucy one on one. As part of the program Kathy will provide a short training session to teach youth about giving commands and proper grooming. Not only will this teach the youth proper handling techniques, having Lucy follow their commands will also provide them with a sense of accomplishment. We’re very fortunate in Snohomish County to have a Prosecuting Attorney that cares so passionately about victims of trauma, their families and our drug courts. We are also grateful to Canine Companions for Independence, a private non-profit organization that breeds and trains dogs, primarily for people with disabilities, for providing Lucy. Here’s an exciting opportunity to upgrade your juvenile drug court. The Office of Juvenile Justice and Delinquency Prevention (OJJDP) recently released a solicitation for “OJJDP FY2014 Enhancements to Juvenile Drug Court” which will provide up to eight juvenile drug courts with as much as $500,000 over three years. The deadline for applications is July 23rd. The RFP states, “OJJDP will make awards to currently operating juvenile drug courts to enhance their capacity and the services they provide. A juvenile drug court provides comprehensive, developmentally appropriate, community-based services for youth who come in contact with the juvenile justice system due to alcohol or other drug use.” The solicitation says OJJDP welcomes applications that involve two or more entities. This grant is a great opportunity for communities interested in integrating Reclaiming Futures into their existing juvenile drug court. As a partner to drug court applicants to this RFP, Reclaiming Futures could serve as a provider of technical assistance. Reclaiming Futures has experience with data collection, the use of scientifically based screening and assessment procedures to identify youth in need of substance abuse and mental health services, staff training, family and community engagement, outcome monitoring and evaluation. If your community is interested in applying for this grant and would like to learn how Reclaiming Futures fits into your proposal, contact Donna Wiench, Reclaiming Futures Strategic Partnership Director to learn more. Forsyth County’s juvenile drug-treatment court celebrated its first three graduates in April. The Forsyth County juvenile drug-treatment court started in January 2013 and is geared toward nonviolent youths ages 12 to 16 who have substance abuse problems and have been sentenced to probation in juvenile court. Participants are required to remain in school, perform 25 hours of community service, and are subject to random drug testing. It typically takes nine to 15 months to graduate from the program, with assessments every 90 days to monitor the teens’ progress. Forsyth County Court works with the local Reclaiming Futures to carry out assessments. Jemi Sneed, project director of Reclaiming Futures, said all participants are assessed to determine what type of substance abuse and other treatment they need, and then directed to the most appropriate treatment. Judge John Schwartz founded the first Drug Court of New York in Rochester in 1995—at a time when the idea was highly controversial. On Friday, Oct. 25, Judge Schwartz presided over his last graduation as he prepares for well-deserved retirement. Judge John Schwartz started his career in 1983 as a Rochester City Court Judge and has accomplished a tremendous amount for the New York Drug Courts. The Honorable Judge Schwartz has received several prestigious awards for his contributions to the Courts and his positive impact on the community throughout his career. His last graduation class was monumentally successful; 85 newly clean and sober participants graduated—the largest group in the court’s 16-year history! It was the 46th graduation ceremony at the Hall of Justice in the Rochester City Court, and more than 200 people from across New York attended. One particular special guest, Beth Coombs—a graduate in Judge Schwartz’s first class—traveled from California to speak on behalf of his groundbreaking work in the Drug Court field. “He put his reputation on the line so we could have a new way of life,” said Coombs, who currently works for a nonprofit association. Another speaker on behalf of Judge Schwartz was West Huddleston, CEO of National Association of Drug Court Professionals, who praised Schwartz’s achievements within the state of New York and the Drug Court. In celebration of National Drug Court Month, Montgomery County Juvenile Court held a graduation ceremony celebrating youth who have successfully overcome drug and alcohol abuse. National Drug Court Month is coordinated on a National level by the National Association of Drug Court Professionals (NADCP). This year, Drug Courts throughout the nation are celebrating National Drug Court Month with the theme ‘Drug Courts: Where Accountability Meets Compassion.’ This uplifting commencement ceremony is evidence of the tremendous impact the Montgomery County Juvenile Drug Court has had on our community and will send a powerful message that Drug Courts are a proven budget solution that saves lives and dollars. Like the other 2,700 operational Drug Courts in the United States, the Montgomery County Juvenile Drug Court is a judicially-supervised court docket that reduces correctional costs, protects community safety, and improves public welfare. In Drug Court, seriously drug-addicted individuals remain in treatment while under close supervision. Drug Court participants must meet their obligation to themselves, their families, and society. To ensure accountability, they are regularly and randomly tested for drug use, required to appear frequently in court for the judge to review their progress, rewarded for doing well and sanctioned for not living up to their obligations. Research continues to show that Drug Courts work better than jail or prison, better than probation, and better than treatment alone. Fifteen young men and women were among this year’s graduates. The ceremony marked their completion of an intensive program of comprehensive drug treatment, case management, mandatory drug testing, community supervision and incentives and sanctions to encourage appropriate behavior. 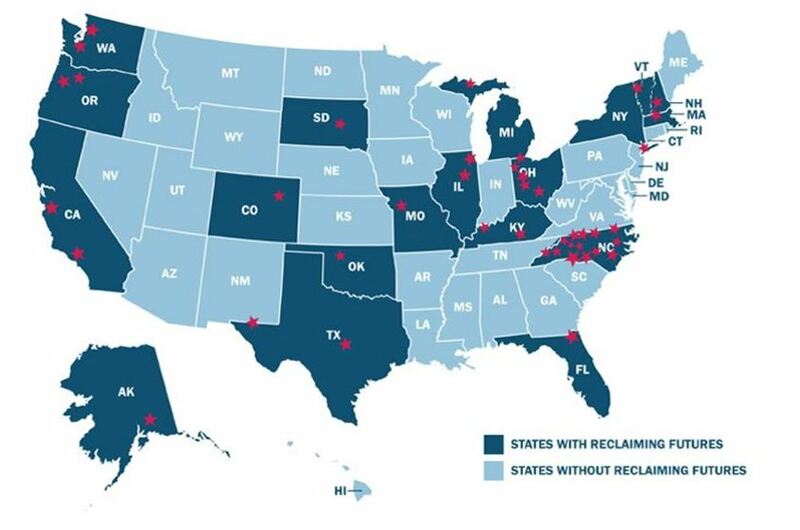 Reclaiming Futures works in 37 communities across the country to break the cycle of drugs, alcohol and crime. In about one-third of those sites, Reclaiming Futures partners with drug courts, which, according to years of research, work better than jail, prison, probation or treatment alone to significantly reduce drug use and crime. To celebrate this, and the many lives that have been saved, please join us, and plan ahead for National Drug Court Month in May. Hold a commencement ceremony to recognize the accomplishments of participants. Schedule a meeting with your members of congress while they are home for Constituent Work Week, May 1-3 and 28-31. Have your Drug Court judge and graduate attend the meetings to educate policymakers. Organize a community clean up. Clean a park, street, highway or school. Invite all treatment, mental health, court, law enforcement and probation staff to join in. Start a local donation drive. Across the country, juvenile treatment drug courts (JTDC) are helping teens achieve better outcomes by focusing on treatment and family engagement. JTDCs treat teens for both substance abuse problems and mental health issues, as needed. As David Morrissette, senior program manager at SAMHSA, explained to SAMHSA News, "up to 70 percent of youth in the juvenile justice system have mental health disorders and more than 60 percent of those also have a substance use disorder." In a 2012 evaluation [ppt] examining data from 1,934 young people participating in drug courts at 17 CSAT grantee sites, evaluators found that participants saw a 26 percent increase in the number of days they abstained from alcohol and other drugs between intake and a 1-year follow-up. Participants' scores on a scale measuring emotional problems and difficulties with self-control declined by 16 percent. The average number of crimes reported dropped by half. According to the evaluation, a more intensive approach to juvenile treatment drug courts called Reclaiming Futures reached youth with more severe problems, provided more services, and did an even better job of increasing abstinence, reducing emotional problems, and reducing criminal behavior. "There are six stages in the [Reclaiming Futures] model," said SAMHSA Project Officer Holly Rogers, M.A. "These include screening and assessing young people to identify alcohol or substance use problems, coordinating services across agencies, helping kids and families make an initial contact with services, getting them actively engaged in services, and transitioning them out of services and into long-term supports, such as helping relationships and community resources." An estimated 130 young people arrested each year in Ventura County, California, are diagnosed with substance abuse or co-occurring mental illness problems. But there is good news for these teens and their families. Ventura County's juvenile drug court is turning young lives around with the help of Reclaiming Futures. Our team recently worked with "JM" to access appropriate treatment and connect to a support system beyond treatment. Consistent and substantial evidence exists that supports the relationship between substance abuse and criminal behaviors in youth. Youthful offenders demonstrate elevated rates of substance abuse in comparison to non-offending youth. Substance abuse often increases recidivism and reflects a deeper involvement in the juvenile justice system. Drug and alcohol use also increases the likelihood that a youthful offender will have prolonged interaction with the juvenile justice system. In addition, substance abuse produces antisocial behavior in youth. Severe substance abuse is associated with increased rates of offending and more serious offenses. Furthermore, the younger the child is at the onset of substance use usually reflects greater probabilities for severe and chronic offending. For example, in 2010, the Texas Juvenile Probation Commission found that twenty-five percent of all the juveniles referred were “frequent drug users.” In 2009, forty-seven percent of children committed to the Texas Youth Commission were chemically dependent. Less than half of these chemically dependent children received any type of substance abuse treatment. The development of effective substance abuse treatment programs for juvenile offenders should be considered a “vital component” for overall rehabilitation efforts. It is not mission impossible for the Juvenile Justice Center teens enrolled in the first year "Mission Possible" program at the South Bend Kroc Center. According to the Childrens and Youth Ministries Manager Jacqueline Davis, the mission is to try to give struggling teens a new direction. U.S. Attorney Barry Grissom reported that a $400,000 federal grant to the Kansas Juvenile Justice Authority will help evaluate disproportionate minority contact in the juvenile justice system. Massachusetts will be the first state to implement the ‘pay for success’ model of social financing through a Juvenile Justice contract and ROCA of Chelsea will help lead the effort with two Social Innovation Financing (SIF) contracted partners. Recent improvements to the long-troubled juvenile justice system in Texas are already in jeopardy, if a just-released survey of officials in 73 county youth probation departments is any indication. Officials in Lauderdale County, Mississippi, have operated "a school-to-prison pipeline" that violates the constitutional rights of juveniles by incarcerating them for alleged school disciplinary infractions, some as minor as defiance, the U.S. Department of Justice said Friday. Shelby County, Tennessee court officials say they will move the juvenile defense system from Juvenile Court oversight and place it under the office in charge of defending adults. The Atlanta, Georgia De­part­ment of Juvenile Jus­tice has a new investigative tool: a Web site where people can report suspicious activities at the state’s youth detention centers and court-services offices. Youthful offenders at Baltimore Detention Center won't be better off if the state builds a new $70 million juvenile jail; the whole policy of charging minors as adults needs rethinking. Voters rightly grasped that this proposal was not about new jail beds, but about a critical investment in a public service. The alternative, sinking an estimated $40 million into repairing the current buildings, was not the answer. This fact sheet examines adult and juvenile drug court program models and OJP’s support of adult and juvenile drug courts. It also provides facts, research findings, and additional resources regarding drug courts. This afternoon we heard about an upcoming evaluation of six Reclaiming Futures juvenile drug courts. Bridget Ruiz, a technical expert on adolescents from JBS International, chaired the session and opened the panel presentation with a discussion of the history of juvenile drug courts and Reclaiming Futures and also outlined the important elements of each approach. “Evidence shows that combining the two models has been effective in helping young people, “ said Ruiz, who formerly was an associate professor at the University of Arizona. Erika Ostlie, a senior policy associate at Carnevale Associates, gave an overview of an upcoming evaluation supported by the Office of Juvenile Justice and Delinquency Prevention (OJJDP) of six federally funded Reclaiming Futures sites. Parents and their teens are often blind to the serious legal risks that come from misusing prescription drugs. Such drugs are often perceived as safer to use than illegal drugs because they can be obtained through a prescription. But that’s not how the law sees it. While most commenters praised youth courts for taking a humane approach, reader Beliavsky from Boston wrote, "Letting young criminals (excuse me, 'troubled youths’) be judged by other young criminals does not seem right to me. There should be a real, non-criminal, adult, judge." Beliavsky is assuming that Youth Court is the soft option. It’s often not so. As reader Andrew Rasmussen of New York said: "The appropriate comparison would be kids who do something and are taken home by the cops to their parents." There is evidence that youth courts do more than simply divert teenagers from juvenile justice: they actively create pro-social behavior. The Urban Institute study found a clue: the courts that give the most autonomy to the teenagers themselves work best ... Youth court is one of the few places where teenagers hear disapproval of their behavior from people whose respect they crave the most: their peers. Effective incentives and sanctions are essential tools in motivating youth to change their behavior. What can we learn from behavioral research and what can we learn from the experience of others? This two-part highly interactive online workshop will help you discover and put into practice the key components of a system of incentives and sanctions that can help bring about and sustain behavior change.